STOP! Don’t Press Publish! Have You Remembered to Add The LINKS? Are you remembering to link to articles, websites or other blogger’s post when you write about them? Why NOT? It’s really frustrating when you can’t check out more details in a post because the blogger’s failed to link. Readers won’t waste their time Googling to find the facts. Why BOTHER — it’s easier to change to another blogger. Linking is a really important part of being a blogger and linking isn’t hard! Yet for some reason most new bloggers FAIL to link! Copy the URL of the website you want to link to. In the post that you are writing highlight the text you want linked to the website and click on Insert/Edit Link button, paste the URL and then click INSERT. Most bloggers like to check out posts when people write about them and some will take the time to write comments on your posts. 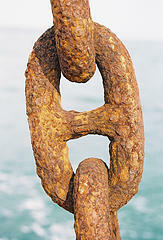 Linking to other bloggers is one way of increasing the conversation and readership of your blog. What tips on blogging would you give new bloggers? Image by tarotastic licensed under Creative Commons. Thank you very much for this blog! I’ve just learnt how to add links and I’m sure I’ll be visiting you again and again in the future. I’m starting my new blog and I find it fascinating! Hope to go on learning from you! Glad it has helped you learn how to add links and congratulations on starting your blog. Please let me know any time if you would like me to cover a topic. @Maria You need to first highlight the text you want to link to (that you have written in your write area) and then you will be able to click on the Insert/Edit Link button. Whether parents will be able to comment on pages will depend on the theme you use. If you do a search of this blog there is a post on which themes allow comments on pages. Anyone can write comments on a post or page (that allows comments) all they need to do is add their name and email address. I suggest you check out my info for first time readers as it explains this at the bottom. Also you might like to grab the manuals for using Edublogs as they are helpful when getting started using Edublogs blog. Ok, I’lll go right now and try to write, highlight, and enter a link. No problem at all Maria. There is a lot to take in when you first start blogging. So just focus on taking small steps at a time. I have signed up for a free edublog for my student teaching. My Tech Prof said I should be able to link other web pages and podcasts and voicethreads on my pages, not just on a ‘link’ on the front page. When I pull up a ‘page’ my ‘edit/insert link’ icon is pale and will not open. Can I just upload all their emaiils to ‘able to comment’ or do they each and every one have to sign up. Very beautiful and good blog. As you think, how usefully to education of children Zoog Disney, in opinion of teachers? And what influence is rendered by all products Disney? 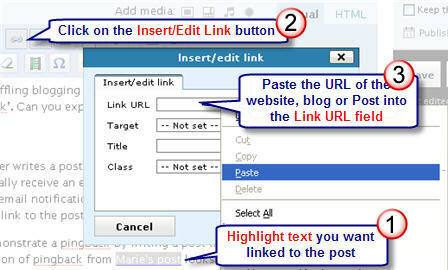 @eduspacelounge You will only see the link icon change colour after you have highlight the words you want to link to. When I write a post, the link icon doesn’t work (faded out). Is there any way that I can turn the icon on? @Chamon Glad my post has been helpful. Sounds like you have an exciting time of exploring ahead of you. Best luck with your blogging adventure. Seeing I’m brand spanking new to the blogging world, I’ve been fumbling my way through all of this. Then I saw your blog on linking and it has helped me immensly!!!! Thank-you. @Ken Yes there is definitely a balance between the right amount of information to adequate linking. I’m probably not so good at coping with excessive linking. A fan of links? Hmmm. One thing I learnt about links on web pages and blogs (way back) was that if the text was well written, the links didn’t bother me when I read the text. I treated links in the same way as I treated glossed word (for in fact that’s what they amount to). If I knew the meaning of a glossed word, I didn’t need to click the link. What is really frustrating is getting a reference to a writer or a topic that I don’t know anything about and there being no link to find out more – as you say. But to gloss every (other) word in a sentence . . . I’ve seen that! I just ignore them. @Larry Yes learning how to link in posts is something that ‘newbies’ wonder about plus I know they would also like to know how to write the links in comments. Always happy to link to your blog Larry – we really appreciate your support. @Pumba Have you tried following the instruction in this post? @Ken For me there is a balance between providing enough links and too much. I prefer it when bloggers provide enough information for me to want to check out the links and aren’t a fan of links without much of a reason why I might check out. Larry’s blog is excellent. More excellent tips! This set is precious for learning more. It also saves the blogger writing a soliloquy on a relevant topic that another blogger has already waxed the eloquent on. Good post about a topic that I suspect that many experienced bloggers assume “everyone” knows already, but one that that “newbies” wonder about. I remember that how to create a link was one of the first questions I had, but I had to learn through trial and error since I couldn’t find instructions anywhere. And thanks for using a link to my blog to illustrate the point! Adding a comment to an older post but think it’s worth the mention. I have learned a lot over the past year of blogging but I know that there are some things that remain way over my head and the newbie bloggers heads as well. When the time is right and when we have enough background knowledge we will learn it. Without the foundation, it’s too much of a challenge. So repeating, what many may consider to be simple lessons, is going to be helpful. Larry, you are the Master of establishing the best background knowledge and you share it through your blog every day. Totally agree Gail and there is always that constant need to have the blend of posts that extend while others that revisit previous topics. Sometimes it can be a hard balance. Excellent link BTW 🙂 – and agree that Larry is incredible. People often comment on older posts on The Edublogger which is good and I try hard, when appropriate, to respond.